As Malaysia bids goodbye to hosting Formula One and focuses on MotoGP, Automologist LING thinks that we might be able to produce a World Champion from the dodgy streets of Kuala Lumpur. The recent automotive news that has been making rounds in my home country is that of MotoGP World Champion, Valentino Rossi, being shocked after witnessing the antics of Mat Rempit’s who take to the public roads of Malaysia, especially at night, to engage in illegal motorbike racing and daredevil antics. Read the report by Malaysian Digest here. “Rempit” translates to “racing” and “mat” is a term referring to young lads. I’ve had my share of encounters with them. I hear sometimes one or sometimes a gang of them coming up from miles behind my car, and as they hurtle past, they are oftentimes lying on the motorbike seat in prone position, in what is popularly known as the “Superman” manouevre. Every time, I cannot help but expect, as they leave me in their dust, that at any moment I would hear a loud crash. And indeed, that did happen once, and I drove past the guy lying on the ground alongside his wrecked motorcycle, as I tried in vain to not think smug thoughts. In recent months, Mat Rempit’s have been making headlines in Malaysian news. One particular illegal race in October saw an innocent pedestrian decapitated. 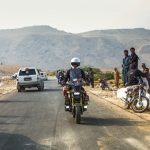 The victim, a homeless man, was crossing the road when three motorcycles barrelled down the road, one knocking him down and another running over him, which caused his head to be severed. In another incident, a couple in a Perodua Myvi was surrounded and then pursued by a gang of bikers for no apparent reason (at least, none reported in the news), who threw rocks at them demanding that they stopped the car (who in their right mind would?!). The terrified couple kept on going on a busted tyre until the hounds dropped off when they approached a toll plaza. The government has been scratching its head for a solution to the problem of Mat Rempit’s, and earlier this year, Federal Territories Minister, Datuk Seri Tengku Adnan Tengku Mansor, said that he and the mayor of Kuala Lumpur are considering hosting street races for motorcycles, to “control the situation”. Tengku Adnan also said that “(They) are aware that this is their only form of entertainment due to the high cost of living”, which I think is oversimplifying the causality (a movie ticket here costs less than US$4, just saying) although I do agree that the cost of living in the country is escalating and legalising street races, with proper organisation and safety considerations, could help curb the problem. As Malaysia shifts focus from Formula One to MotoGP – the latter in which Malaysia is represented and in the former, it is not – there have been talks about the government spending more on developing motorbike sports in Malaysia and increasing public access to track days. (Read also: No More F1 in South East Asia). And since the Sepang International Circuit will no longer be be used for F1 after 2018, how about filling that void with a bike stunting competition? 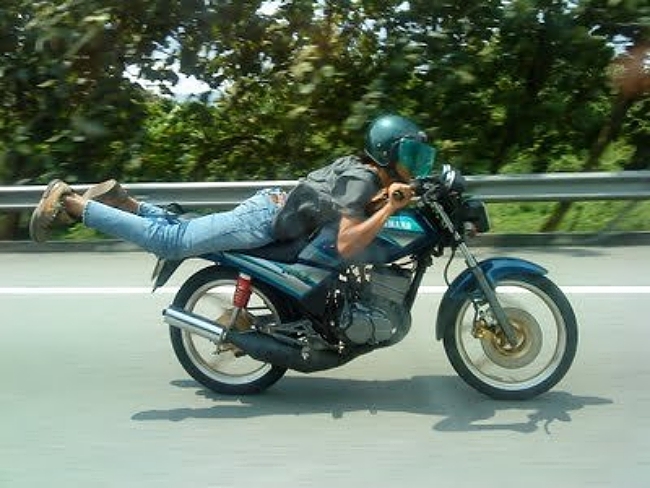 Imagine what our amateur Mat Rempit’s could do – and I have to grudgingly admire their impeccable balance on a speeding bike – if they turn professional bike stunt riders. A track day at Sepang. If nothing else, I will no longer have the crap scared out of me when I’m driving on the streets of Kuala Lumpur at night.